They’re back BUT bigger and better? 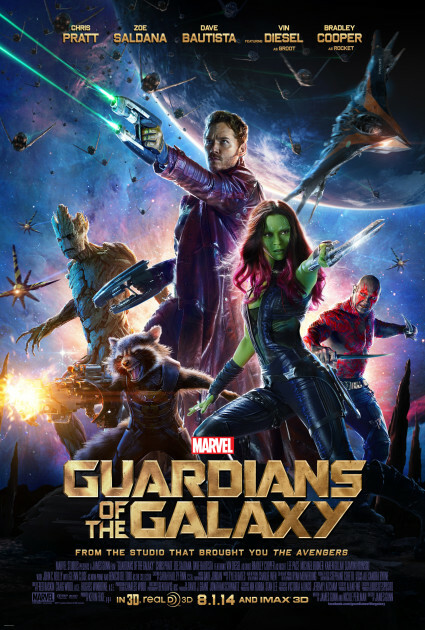 The Guardians must fight to keep their newfound family together as they unravel the mystery of Peter Quill’s (Chris Pratt) true parentage. Mad fun BUT it falls short of its predecessor. The silly opening was entertaining enough as the adorable Baby Groot danced around to the beat of ELO’s Mr Blue Sky while a violent battle ensued in the background. I felt the banter and chemistry between the dysfunctional team was all over the place. Writer/director James Gunn tried too hard with the laughs that it hampered the piece in places with the cast just shouting flat insults at each other. I know a good portion of the story was about the team having teething problems after the events of the first film. BUT the squabbling and yelling really grated against me. A gag involving the name of a villain drew a laugh BUT it soon overstayed its welcome as the name kept getting brought up. I felt Vol 1 had the right balance. Each dysfunctional member bringing something to the fold. This time around, it felt a lot sillier with Rocket and Groot spending too much time in the background. No one expected anything from Vol 1. It was one of my favourite films of the year. I think I even went to the cinema twice to see it and I never do that for a movie. Such a strong first movie that it was going to take something special to top it. Henry Braham’s incredibly colourful palette and visual effects were a feast for the eyes. The set pieces were exhilarating and fun to watch. Kurt Russell was brilliant as Ego. He worked well with Pratt and made their relationship an interesting angle BUT the only problem was that the pace tragically lagged as Quill discovered his true origins. Even if Laura Haddock’s talents (Transformers: The Last Knight) were wasted yet again. I wondered when she got the role as Star-Lord’s mother if there was going to be more of her BUT what we got was unnecessary and offered new. Bradley Cooper’s Rocket (Easy now) stole the show with his insults and crazy antics (“Don’t call me a raccoon! Trash panda? *PAUSE* Is that worse?”). Vin Diesel had the easiest job going yet again delivering his helium induced phrases to the tiny tree root. You couldn’t resist the little rebel. Elizabeth Debicki (The Night Manager) was completely wasted in her role as Ayesha. However, there was one character that stole the show for me and that was Yondu. Michael Rooker (The Walking Dead) was fantastic. I loved how we actually got a little depth to the space pirate and explored his past. An unexpected surprise. Pom Klementieff (Oldboy) was a memorable addition to the mad (and increasingly top heavy) squad as Mantis. Her emotion sensing abilities was a party trick that helped create all sorts of cringe inducing laughs. Especially on “the thing that nobody’s talking about” between Gamora and Quill (Yawwnnnn . . . ). The only problem was that Gunn expanded on story lines that were already explored in Vol 1. It made things a little repetitive and predictable. Gamora and Nebula’s sibling sparring got on my nerves. Especially when the pair kept kicking off. It was almost as ridiculous as Peter Griffin fighting the Giant Chicken! We had all that in the first one! Don’t get me wrong, there was still fun to be had and I enjoyed the majority of the madness with another fantastic soundtrack that I will no doubt purchase. Not every wrestling star can make the jump to the big screen BUT Dave Bautista was still on scene stealing form as the deluded Drax with his random outlook and bizarre stories. The final act redeemed a lot of the problems with an action packed closer that threw in a few unexpected twists and turns along the way. Don’t worry, no spoilers here. So despite its shortcomings, it was still crazy fun and fans won’t be disappointed. P.S. I’m sure you’re bored of me saying this BUT don’t walk out on the credits. There are several different teasers that pop up. Definitely worth waiting for. Well done Mr Gunn! Marvel have done it again. I would have thought after numerous Marvel entries and the fear of milking this rich cow dry, this may have pushed the mark. I mean, another origin story to introduce another group of characters BUT with this cast and these characters, I’d be happy to see more entries like this again very soon. Now, the plot is hardly original, the inevitable union of these intergalactic criminals was always going to happen, as well as those pesky sequel teasers propping up all through the film. BUT what makes this sci-fi blockbuster hit tick all the boxes for the me is the pace, the humour and the fantastic soundtrack. After a strong and emotional opening with 1occ’s I’m Not In Love playing, I knew I was in for a treat. It helps that the cast are perfectly chosen for their roles. What’s it all about? Now keeping it vague as I don’t want to spoil this as I want you guys to see this . . .
Light years (in a galaxy far far away. No. 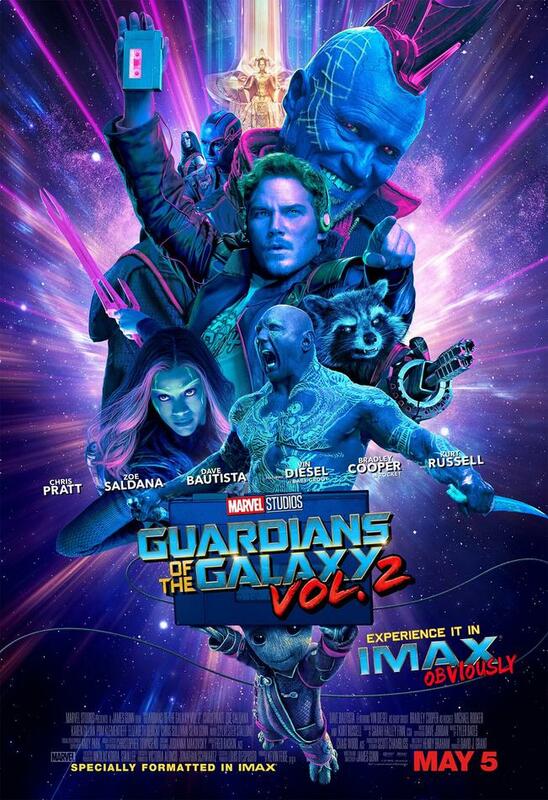 Stop it) from Earth, 26 years after being abducted, Peter Quill (Chris Pratt) finds himself the prime target of a manhunt after discovering an orb wanted by Ronan the Accuser (Lee Pace). The charismatic Chris Pratt, already on a roll after the mega blockbuster hit that is the Lego Movie, applies his laidback, fast talking schtick to the film’s protagonist Peter Quill to perfection. You knew what to expect from the moment he breaks into a song and dance around a space cave using a mutated lizard thing for a mike. Zoe Saldana just proves she looks incredibly hot as any alien or anything for that matter (What?) but is also fantastic as Gamora. The surprise turn for me was Dave Bautista as Drax. Now let’s be honest, I know he’s had acting experience in WWE but this is a whole different playing field and I wasn’t convinced with his jughead performance in Riddick. It helps to have great lines at his disposal but Bautista’s delivery is brilliant as the eloquently spoken if utterly stupid henchman. He takes everything literally which makes for some funny one liners and memorable moments. Bradley Cooper and Vin Diesel provide their voicing talents to two new animated cult characters. Scratch that, Bradley Cooper provides his voicing talents. Vin Diesel must have been laughing when he read the script and got his paycheck as the tree humanoid Groot. The animation and detail on Groot is impeccable. I mean don’t get me wrong, Diesel’s conviction on saying “I AM GROOT” numerous times is good and no doubt an iconic one liner but come on?! Cooper is fantastic as the talking volatile raccoon hybrid Rocket. Now while the animation is impeccable, 3D . . . Not so much. It’s certainly more prominent BUT not a must. Lee Pace and Karen Gillan were almost unrecognizable both by their incredible make up and by their accents as the villains in this space opera. Michael Rooker (Gunn regular) was great as Yondu Udonta, the interstellar smuggler. The only problem with so many characters and such a big cast, some characters or actors (more specifically) get cast aside. Glenn Close, sporting a funky haircut, as Nova Prime was wasted in this installment. John C. Reilly, the comedy legend that he is, only really got to get a bit of meat to chomp on in the closing minutes. Inevitably, Benicio Del Toro’s mysterious Collector pops his ugly white head again. Djimon Hounsou was only memorable due to a humorous encounter with Quill in which he attempts to enforce his self titled nickname, Starlord. Peter Serafinowicz (Shaun of the Dead)’s straight faced pallor had potential . . . BUT didn’t really get used. BUT that’s minor quibbles. Now it’s hardly an origin story. It briefly provides a minor back story to answer the questions (as and when they pop up) to give a little dimension to our lively crew. As it drew to its exhilarating finale, I found myself wanting more. There were unanswered questions which left it all open for more mischief. Little teasers and “if there’s a sequel” hints . . . BUT with the wide array of characters in this universe and great music and great dialogue, I’m happy to strap in and go for another ride across the galaxy again. Of course, they will return. One of the better ones. P.S. There is a little teaser at the end of the credits but I don’t think it was worth waiting around for. Nothing to quack home about. I mean, shout.